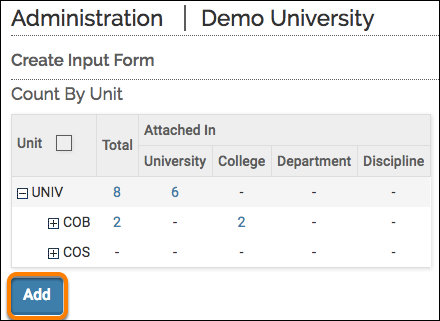 Administrators have the ability to create custom input forms to collect information from faculty members at their institution. Each custom input form must have its own unique name. 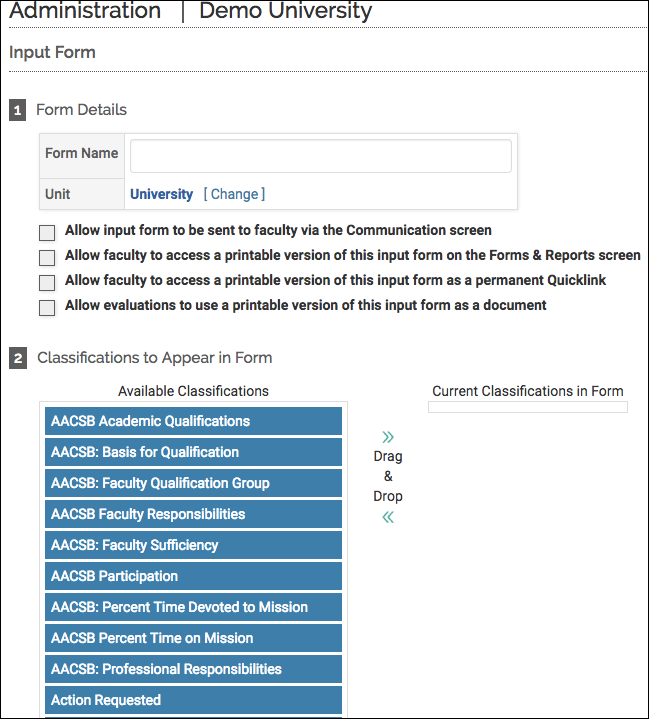 Faculty classifications can be included in custom input forms. Faculty members are notified if they need to complete a custom input form by a notification in the To Do section on the Dashboard. Click Create Input Form in the Input Faculty Classifications section. The Create Input Form screen displays. Click Add. The Input Form screen displays. Use the Form Details section to specify a name for the form, select the applicable unit, and apply other options. If necessary, select any faculty classifications that are applicable to the new form. You can also create a new faculty classification by clicking the Create New Faculty Classification link. Type any instructions for the form in the Form Instructions field. From the Admin mection of the navigation menu, click Administration. Click the unit assigned to the input form to be edited.The Manage Input Forms screen displays. Click the Edit icon adjacent to the form to be edited. The Input Form screen for the selected input form displays.